Imagine yourself being lost in the wild.. you find yourself in a place where food is abundant but you have no pans or other cooking utensils so now what? You have to go primitive, that's what. If you think you need a stainless steel pan in order to make a meal, read on and be amazed. It does not get much more simple then this. 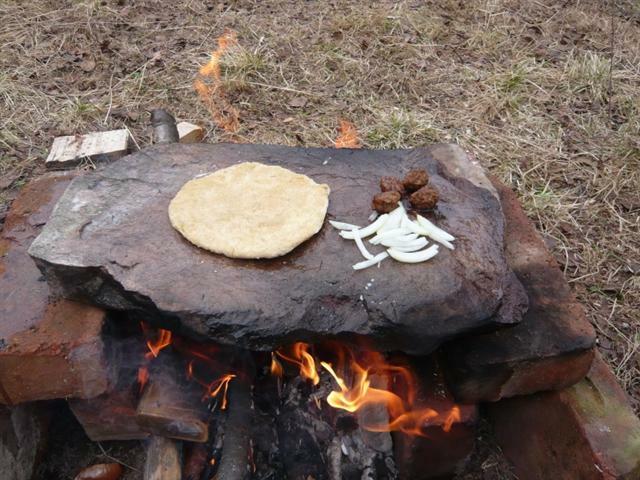 A large, flat rock is placed on a campfire and slowly heats up. Then you can fry anything you want on top of it.. meat, fish, vegetables, eggs.. you name it. While some things require frying, others need boiling. For this method you need a campfire and some sort of bowl made out of clay or wood. Or perhaps you're lucky enough to find a stone that is naturally curved like a bowl. While your campfire is burning gather rocks and place them into the fire. These rocks should be smooth and not porous as those may explode in the heat. Then it's time to fill the bowl with fresh water and the ingredients that need cooking and carefully add the hot stones. So for we covered Boiling and Frying but some of the tastiest foods require baking. Baking bread (or cookies or whatever) can be done simple by making the dough and placing it on top of hot ash of a leftover fire, to some this doesn't sound very healthy but most who have tried it agree that this 'ash bread' has a great taste unlike any other type of bread. Another great way of cooking is by smoking it. You can build a smoking rack and place it over a fire and hang whatever needs smoking over it like on the video below or a similair construction. Meat and fish are populair products to smoke but vegetables and fruits works aswell. It gives a nice taste and it is the best way of preserving your food if you don't have a fridge. Covering a smoking rack with a plastic sheet or leaves so the smoke gets trapped inside is always the best option. This is another fun way of cooking and all you need is being in the right area, which is an area with soil that's rich in clay. Making a clay pot that can be heated in a fire without breaking is kind of hard so this definately isn't the easiest cooking method. There are also different kinds of clay that come in various colors from red ochre 'till chalk-like white clay. and some add other ingredients to the clay in order to make it more fire resistant. Some clay types, once heated in the fire, stay hard and are waterproof. Other types soften up once you add water to them even while it was rockhard after heating it in the fire.. I'm speaking from experience. I'd recommend having two containers of water for the water boiling method. As you pull rocks out of the fire, they'll have ash on them. Dunking them quickly in the first container will get the ash off, leaving a clean stone to put into the soup container. Putting them straight from the fire into the soup container puts lye into your soup... don't want that. If you dunk them in water before the water you won't to boil it will remove a lot of the rock's heat and will make it take longer to boil the desired water. If you have a container that can take rocks hot enough to boil water without it scorching the bottom or melting the plastic, why don't you just boil water in that container? I know this used to be used by Mongolians to cook in leather pouches. Which would work in that case. I don't think cast iron is considered "primitive". You can boil water in a brown paper bag too! What does your survival kit looks like? I am going to live in the wild, Goodbye all.